Chris signing books at the new Powell River Library. 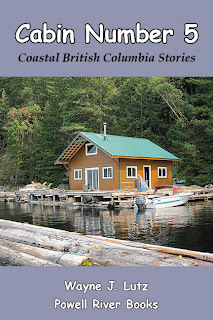 Earlier this month I shared about having author Chris Czajkowski as a guest at my condo here in Powell River. She was on her new book promotion tour and was schedule to make a presentation at our new Powell River Public Library. You can read more about that visit by clicking here. As a thank you for being her host, she gave me a signed copy of her new book Harry: A Wilderness Dog Saga. Since her visit I've had time to to enjoy this wonderful new book. Chris is a prolific writer about wilderness adventures. 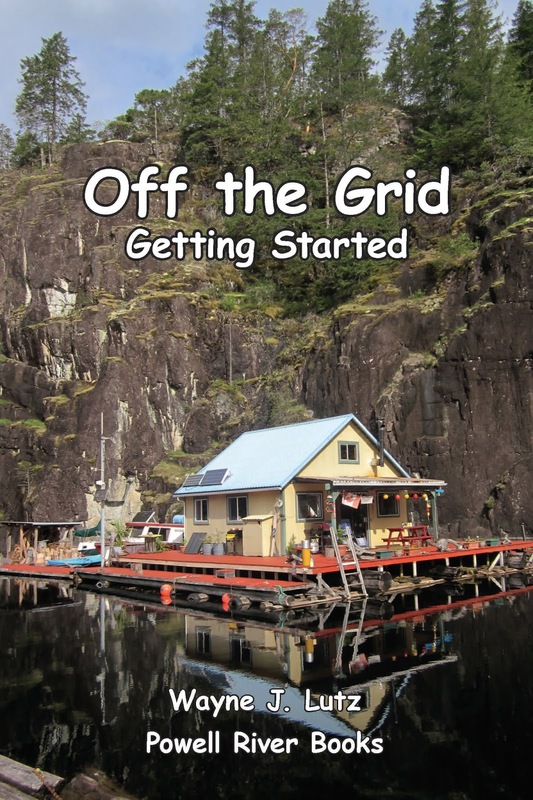 So far she has published a dozen titles about her rustic life in the Chilcotin region of British Columbia. Dogs are an important part of Chris' life. They are of course companions, but also work in their wilderness home. Each one was trained to carry packs to help Chris reach her Nuk Tessli wilderness resort. Now that she lives on a homestead closer to (but not in) town, they still carry loads on solo hikes or excursions for guests. Harry isn't Chris' first book written from a dog's point of view. Lonesome: Memoirs of a Wilderness Dog took the reader through the early years setting up and running the hand-built Nuk Tessli resort. Now Harry and his companion Badger continue the saga. Chris has had many dogs over the years. The book begins with Harry traveling to the homestead via airplane and a long van ride. When they arrive, he mets his new pack mate, Badger. Older and wiser, and after a shaky start, Badger took the young Harry under his wing and started to tell the tale of the other dogs that had shared Chris' life. In addition to Harry and Badger, Chris' current canine companions, you'll meet Nahani (Badger calls her a piece of work) and Lonesome (who was with Chris at the beginning of her wilderness adventures). You'll experience the rustic resort Nuk Tessli and meet Taya (a former sled dog) and Sport (Taya's pack mate) followed by Max (the puppy) and Ginger (of two nasty habits). As one dog left, another arrived. Next was Tessa from the SPCA, but when she didn't work out Bucky (Bucket Head) took her place. Then Raffi had to be rescued from a "rescue" agency. Next came the move from the mountains to the homestead at Ginty Creek. Bucky had to leave for a new home and Nahani arrived, then Badger and finally Harry. And now we've come full circle. Unloading the quads at Chippewa Bay. Summer rides are fun because the weather is usually sunny and warm. The down side is dusty roads and trails. Fall rides are just about perfect, the weather is pleasantly cool and the roads have received enough rain to tamp down the dust. We loaded up the barge with what we would need for a day quad ride to Chippewa Bay. The quads stay on the barge all year long, but in the rainy season we take everything out of our cargo boxes to keep it from getting damp and possible damage. Plus it's always good to take along a chain saw just in case a fallen tree blocks your way. Riding well used Museum Main to find the new logging roads. We wanted to ride over in the Chippewa Bay area on Powell Lake because Western Forest Products has been building new roads into future cut blocks. We like riding through the trees before logging begins. We've been able to experience such rides in the Eldred River Valley, at Chippewa South, at Pickles Point and now in Chippewa Bay. Large fir trees along Chippewa Main. After the roads are completed, the logging company waits for several months for the newly compacted dirt and rock to settle before heavy logging trucks and equipment begin their work. Wayne coming down a new section of road. We missed seeing all of the large trees cut down to make way for the new road beds, but a few were still resting at the side of the road. Wayne next to two sections of a huge fir tree. This fir tree was over a hundred years old based on the tightly spaced rings. Just think of all the lumber that could come out of each section and how many new homes it could help to build. Tightly spaced rings make this tree well over a hundred years old. There are sections of road that are too steep for me to feel comfortable. Wayne rides ahead while I get off my bike to explore and take pictures. I found a Western Toad hiding in a hole. Right now her looks pretty secure, but I'm not so sure it will stay that way when huge trucks start rolling with their massive log loads. A Western Toad in his hidey at the edge of the new logging road. And there were still a few flowers to be seen. Pearly Everlasting doing what it does best, lasting forever. A bee enjoying a last few sips from a Butterfly Bush. We stopped by the log skid and could see a boom of logs already boomed together. These came from road clearing. It's good to see nothing being wasted. Looking down the skid to the first boom of logs. Wayne checking his iPad GPS to see our track for the day. Using the iPad GPS for road identification and tracking. Western Products Products has online geo-referenced maps that can be used with handheld devices. Click here to find WFP map and other road building, logging and hauling information. Click here to find information about the Avenza map app. The basic app and WFP maps are both free. Have you been riding this fall? What are some of your favourite destinations? 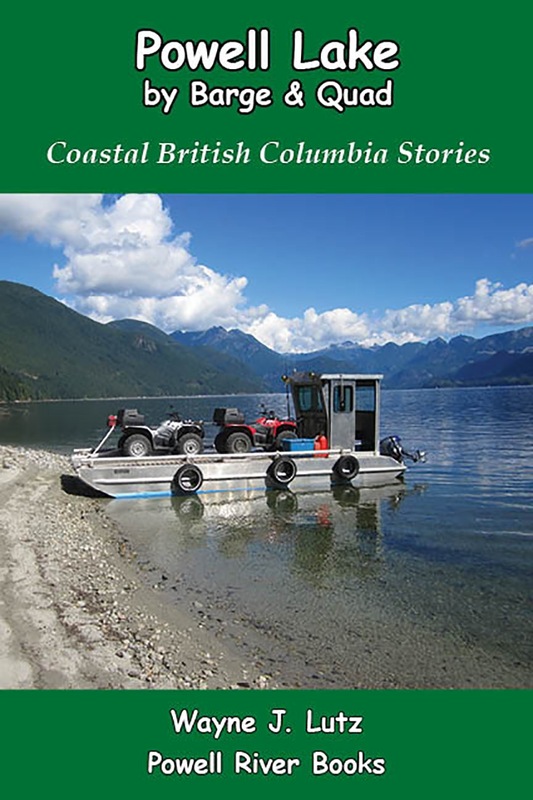 Want to read more about how we use a barge to take our quads to ride the logging roads surrounding Powell Lake? My twirling bird feeder in summer. 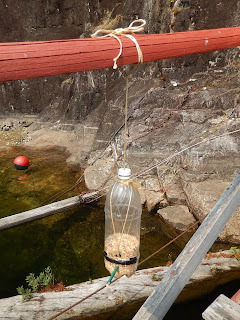 A little over a year ago, I saved directions about how to make a twirling bottle bird feeder from one of my favourite blogs, Wanderin' Weeta (With Waterfowl and Weeds). I made one of my own last summer. Click here to see the directions. It worked fine until the rains came. The u-shaped openings that allow birds to feed also allowed rain water to get into the bottom with no way out. The result, soaked and swollen birdseed. Using a nail to drill holes in the bottom. It was time to make some modifications or take it down until next summer. I chose to make some changes to improve performance. Cut a small hole in the pan's middle. Tape the edges to prevent leakage. Drill small holes in the bottom to allow rainwater to drain. Use a small metal pie pan for a roof. Add plastic beads to the bottom to reduce the amount of seed near the drain holes. Use a fuel funnel to fill the bottle through the small top opening. Screw the cap back on above the new roof. Hang the bird feeder from a tree or post. To keep squirrels off, hang it at least a foot away from any branch. Insert plastic beads to fill the bottom area. I hung my new and improved twirling bird feeder back on the bridge railing. It is in a perfect spot for me to watch the action from my side of the sofa in the cabin. So far, two Oregon Juncos have been using it. Beads fill area below the feeder openings. Plus a chipmunk who's learned how to leap about two feet from the bridge deck up onto the smooth round perch. At least he eats daintily and doesn't flick the seeds into the lake water below. Using a fuel funnel to fill with seeds. Now I use a plastic fuel funnel to fill my bottle. The bottom of the funnel fits nicely into the top opening. No more seeds spilling out of my rolled up paper funnel. Did it solve my problem? So far, but the really heavy rains haven't arrived yet. I'll keep you posted. The improved twirling bottle bird feeder hanging from our bridge to shore. Here's my feeder ready for whatever the fall and winter may bring, or at least I hope so. 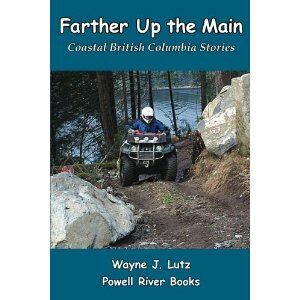 During early summer, Wayne and I went on a camping trip to Vancouver Island to go quad riding on the logging roads and trails northwest of Campbell River. While we were riding north of McCreight Lake, we found an old logging road heading off into the bush. We followed it for about a klick and came out into a meadow filled with Sweet Gale. A creek ran through the meadow and nearby I found a large shrub covered with clusters of white flowers. From a distance it blended into the trees bordering the meadow. A large Pacific Ninebark shrub in the middle of the forefront. Pacific Ninebark (Physocarpus capitatus) is a member of the rose (Rosaceae) family. It grows to 4 metres (13 feet) in height. The leaves are palmate, deeply veined, serated on the edges, and have 3 to 5 lobes. They are a shiny green and lush looking. The flowers form in clusters. Each has five round white petals with yellow pistils and 30 stamens with long filaments. Some of the clusters flowers changing into red seeds pods. Here's a branch that contains both flowers and seeds. Flowers and seeds are present in early summer. Reference: E-Flora BC: Electronic Atlas of the Flora of British Columbia (online) and "Plant Parts" at The Great Plant Escape (online). 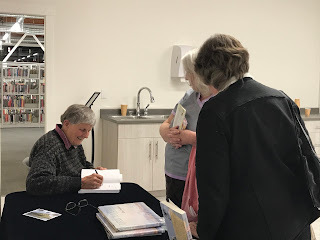 On Tuesday I had a wonderful experience, meeting one of my favourite authors in person. Chris Czajkowski is on a tour for her newest book about her wilderness dogs. After two events on the Lower Sunshine Coast, she came to Powell River's new library. I've read most of Chris' books including Lonesome: Memoirs of a Wilderness Dog, a book told from another of her dogs' point of view. Chris' new book is told through the eyes and mind of her current companions Harry and Badger. 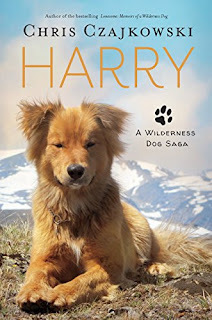 Harry: A Wilderness Dog Saga recounts their years together with Chris at the remote Nuk Tessli cabin and Chris' current homestead at Ginty Creek. Both locations are in British Columbia's northern interior. I've been following Chris' Wilderness Dweller blog for several years. When I read she was going on tour, I wrote a comment. She sent me a personal email and we made arrangements for her to stay at our condo in town. There just wasn't enough time to go up to the float cabin. After a brief stop to get organized and walk the dogs on the Sea Walk, we were off to the library. There was a great turnout of interested readers. Powell River is a literary town, so visiting authors are warmly welcomed. After the slide show and talk, we headed home for a quiet evening. Chris' tour is very demanding. After a presentation on Monday, two on Tuesday, she was off to Courteay on Wednesday morning for another. I'm really grateful she had time to put Powell River on her schedule, and had time for a personal meeting. Danny Wilks is a Scotsman who was inspired to paddle more than 1000 miles through the Inside Passage from Vancouver, BC, to Alaska. 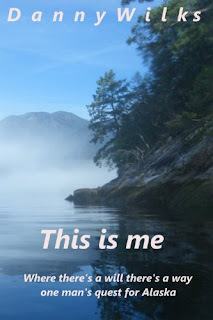 His adventure is chronicled in his book This is me: Where there’s a will there’s a way – one man’s quest for Alaska (self published, 2013). Like many young people who like to travel and have adventures on a budget, Danny participated in WWOOF (World Wide Opportunities on Organic Farms). This volunteer program allows individuals to exchange their labour for meals and lodging in a variety of settings from farms, to mountain lodges and much more. It’s through this program that he was allowed to gain some experience in kayaking. On a subsequent trip to Canada, Danny went to Vancouver, BC, and began to plan his 10-week paddling adventure. On a tight budget, he acquired his supplies including a Current Designs Storm 17-foot sea kayak. To let people know his progress, he created a blog spotthescot.wordpress.com. He updated it when possible (not often on his wilderness route) and asked others to submit pictures and entries. Danny states that he's not a writer and “teachers … would testify to this,” but his story was an entertaining read. Danny embarks from Vancouver and works his way up the British Columbia coast in all kinds of weather. He learned most of his kayaking skills along the way, and in some hair-raising situations. He camped most nights and ate simple meals, augmented with fish when possible. Arriving in Ketchikan was a shock after being alone. Money didn’t go far in a tourist town, and a run-in with US Immigration didn’t help. He was required to return to Canada. He paddled back south to Prince Rupert where he sold the kayak and hitchhiked back to Vancouver. In addition to the blog and book, Danny also took video during his trip. He put the clips together into a two hour and thirty-seven minute film that's available on YouTube. Danny Wilks is one of those people who can take a dream and make it become a reality. He’s had many life adventures, but this is one to remember. I enjoyed the book and recommend it to any outdoor enthusiast, kayaker or adventurer at heart. This is me by Danny Wilks is now available for Kindle at Amazon.